Anushka's Father: Someone has to stand for these lost children, otherwise how will they be able to go home? Q: Why was the running time of the film trimmed? Q: Where can I watch this film legally? Is it available on DVD/Blu-ray? 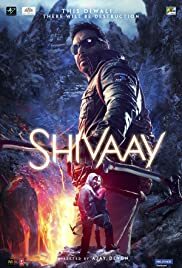 Breathtaking visuals, action sequence,good background score, emotions well expressed without words which is the best part of the movie and must watch if you like action movies. But I felt not so entertaining as I am not a great fan of this genre.1st half was bit slow though second half gains the momentum and keeps suspense till the end. The movie would have been more entertaining if dialogues were there as Indian audience love them the most and Ajay had done it in OUATM, Singham and Singham returns and well accepted and people love it. But in Shivaay lacked it. Anyways to be honest its a must watch movie but for once and if you love action then this is the Bollywood action movie till date. 20 of 38 people found this review helpful. Was this review helpful to you?